Walthamstow CLP: E17 v E20 - Walthamstow vs Walford - so now we know . . . . .
E17 v E20 - Walthamstow vs Walford - so now we know . . . . .
Lenny Henry appearing at the culture, media and sport select committee hearing has criticised BBC diversity plans. This follows Diane Coyle (acting head of the BBC Trust), who commented that the BBC's flagship soap EastEnders is "almost twice" as white as the real east London. 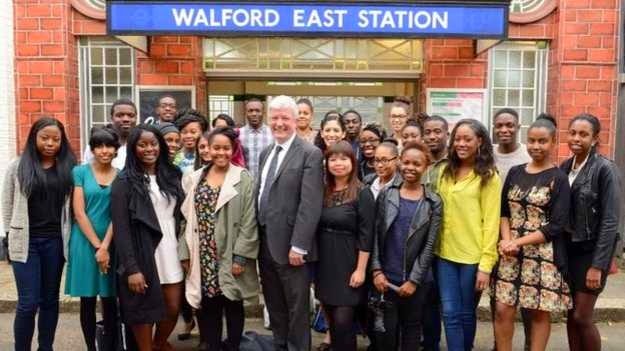 The BBC's audience council in England had compared the population of Walthamstow in east London with Walford, the fictional home of EastEnders. Ms Coyle said it would be "daft" for the show to be a "perfect replica" of the real world. But she added it was "important to ask whether the BBC can do more in its popular output to provide an authentic portrayal of life in modern Britain". Referring to her comments that she made during a speech at the London School of Economics on Monday, Henry said: "EastEnders is the most ethnically diverse of any soap." The BBC said: "We agree with the trust that EastEnders has one of the most diverse casts on British television and that it would be daft to suggest that the programme needs to be a perfect replica of a particular postcode."